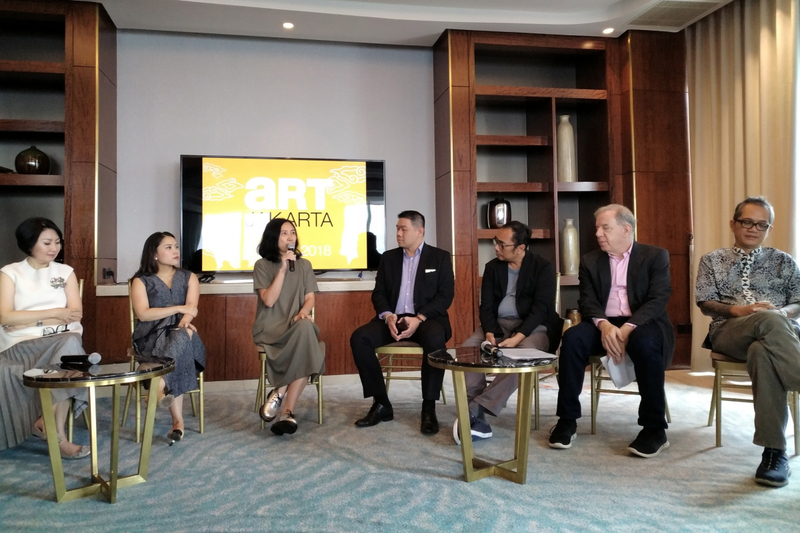 Art Jakarta presents “Celebrating the First Decade of Art Jakarta” from August 2-5 at Grand Ballroom of The Ritz-Carlton Jakarta, Pacific Place. Ahead of the momentous event, Prestige as one of the media partners, was at the press conference on July 12 at the Ritz-Carlton, Pacific Place. Paramitha Soedarjo, the Head of Committee Art Jakarta, Ria Lirungan Deputy Head of Committee Art Jakarta, Gil Schneider Fair Consultant Art Jakarta, and Dedy Koswara, the Deputy Head of Committee Art Jakarta shared this year’s highlights and the broader vision of the event. “Since the it was held for the first time in 2009, this event has been one of the biggest art fair festivals in Indonesia and also been known internationally,” says Paramitha Soedarjo. Indeed it was, Art Jakarta 2017 was visited by more than 47,000 people, and 80% of the artworks were successfully sold. This year, Art Jakarta has collaborated for the second-time with Gil Schneider, the Fair Consultant of Art Jakarta. “The highlights of this year is the ‘10 for 10’ installations with a museum show concept,” he says. The ’10 for 10’ installations are from talented local artists Kemal Ezedine, Yani Mariani, Agus Suwage, Syagini Ratnawulan, Bagus Pandega, Hahan, Chinati Juhansyah, Eddie Sutanto, Heri Dono, and Tere. Aside from the 10 artists, there will be special performances by Japan Art Now and Art Gram, as well as daily Creative Art Classes by Ganara Art Space, and much, much more. Gil Schneider also highlighted that the event is for everyone, from all backgrounds, and not solely for the ones who study art. BEKRAF: An exclusive presentation called “Art Unlimited” to showcase new talented young artists. 2. Crea Art: Starting from July 26 to August 5 at Pacific Place, you can start shopping artsy designs of numerous creative products with great prices. 3. Art Charity Program: You can shop cool art carpets with proceeds benefiting Yayasan Mitra Museum Jakarta. The artists involved in this program are Darbotz, Abenk Alter, Robby Dwi Antono, and Bambang Toko to name a few. 4. Pop Up Restaurant with Chef Seumas Smith. The executive chef of Maggi Joan’s restaurant in Singapore will create scrumptious dishes, especially on Saturday, August 4 for the Young Collectors Gathering. Why should go to Art Jakarta when you don’t really have art background or long-time interest, you may ask? Be quiet. Like in the cinema, it’s disrespectful to hear other people’s high pitch voice or loud conversations when you are taking all the beauty and inspiration. Check in your bags and belongings. There is a dedicated bag check area so you can freely enjoy all the shows and exhibitions. Also, it will prevent you from accidentally knocking over an artwork. Don’t overcrowd. Take turns. Watch out for the queue and read the instructions. Artworks are one-of-a-kind pieces, so you need to safeguard the piece by giving a reasonable space.